A random collection of articles, blog posts, books, and other things I think are worth sharing. Elephant Journal: The 6 Best Spiritual Teachings of Dr. Wayne Dyer (I love Dr. Dyer. RIP). Upworthy: How to take your panic over Trump and the environment and turn it into real action. “These people are scared. Not in any legitimate way, like a young African American male might be when confronted by the police. Not in the way a woman would be go to her car at night. Not even in the way citizens might be in the way their nation was being run. They’re scared because they’re losing. They’re scared because they only know an America where people like them are in charge. An America where in all the places you want to be, people look like them. Are like them. New York Times: How do I explain Kavanaugh to my daughters? Burlington Free Press: Madelyn Ellen Linsenmeir obituary. (This may be a first for me…posting an obit, but…this one bears reading. This country deals with addicts in all the wrong (puritan) ways — punish, punish, punish….when what they really need is help. They are humans suffering from a very real medical/emotional problem. All of them are trying to ease their pain (whatever it is and wherever it comes from). Instead of offering help in the U.S., we throw them in jail. It’s not working..if you haven’t noticed. “It’s not really a contest between Democrats or Republicans, left or right. It’s a contest between the bullies and the bullied. It’s about the power of those who are rich, white, privileged or male — or all of the above — to threaten and intimidate those who aren’t. New York Times: 1 Hen, 76 Ducklings: What’s the deal with this picture? (More photos here). New York Times: Losing Earth: The Decade We Almost Stopped Climate Change (Course, as my father always said: Almost only counts in horseshoes and hand grenades). 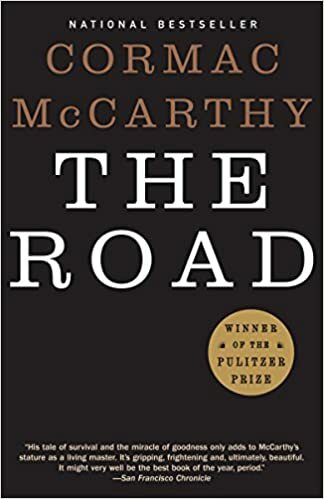 “The Road” by Cormac McCarthy. I’ve had this on my to-read list for years and recently picked up a copy at the Great American Book Sale. I finished it in less than a week and I can’t stop thinking about it. A scary book if only because it reminds you how very fragile our modern world is. You may remember that some scenes for the movie were actually shot at Presque Isle in winter. “Friend, I know you’re exhausted. If you’re not exhausted right now your empathy is busted. But I also know that you aren’t alone. Millions of people are as tired as you are right now. We Were Liars — E. Lockhart — High School Be ready to cry and then re-read the book. When You Reach Me — Rebecca Stead — Grade 4 – 8 This book is so amazing you’ll want to read its companion! Eleanor and Park — Rainbow Rowell — High School I laughed and I cried! So much emotion in this book! Between Shades of Gray — Ruta Sepetys — High School. Lithuania during WWII. Eugene Robinson: You Can Smell Trump’s Fear (Unfortunately, I think we ALL know that a cornered, frightened animal is desperate and at it’s most dangerous).